Today's concept art subject is the Carolina Hurricanes. Got a lot to share so I'll get started right away. First up, a simplification of the current uniforms. It basically drops some striping. Not much to speak of. 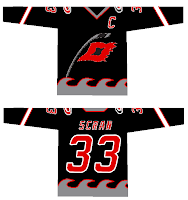 There's also an idea for a black third jersey using the current primary logo. I like the triangular shoulder designs. 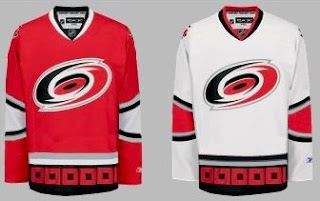 However, a lot of the rumors we've heard suggest that the secondary logo will don the chest of a new alternate sweater. The one on the right is funny because of the waves. 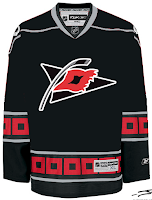 Reminds me of the Lightning's sole attempt at a third jersey in the mid-'90s. But as many have pointed out, that flag is actually a tropical storm flag. It's simpler and therefore makes a more balanced logo. Technically, a hurricane flag would look like this. What do you think of that secondary logo? 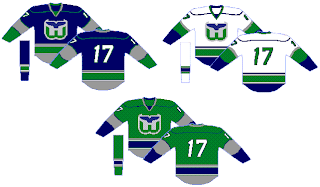 Now we'll go back in time a little to when the 'Canes were the Hartford Whalers. We've got some Rbk EDGE designs for them. That's nice but I don't think the folks from Hartford will be able to identify well with the hurricane flags around the bottom. Probably a better design there. I like that green jersey a lot. Thoughts on these? Post a comment. Next Outdoor Game In NYC?